Anne Morrow Lindbergh, (June 22, 1906 – February 7, 2001), was an American writer, aviator, mother and wife of Charles Lindbergh. 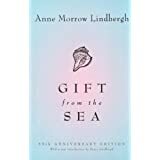 Lindbergh's bestselling novel, Gift from the Sea, is a popular inspirational book, reflecting on the lives of American women and is considered a modern classic. Please enter your email address and click the Follow button to follow Anne Morrow Lindbergh!